An interesting article appeared in the Sunday New York Times. An essay by Clayton M. Christensen claims to have found the way out of the current recession through what he calls “empowering” innovation. However, as I am about to show, his solution is not new or innovative, but something Marx already wrote about. He begins his essay by correctly pointing out that the Federal Reserve has no means by which to end the current economic crisis. It has already tried everything that it can to help. It has lowered the interest rate to encourage borrowing to no avail. It has gone through three rounds of quantative easing (printing more money) failing to get the banks to lend it out. I do not believe there really is anything left the Fed actually do. Clearly there is a problem here today with the current recession, which we seem unable to end. As pointed out in the NYT essay, this recession has gone on quite longer than previous one. Shockingly much longer when one looks at the numbers. “In the seven recoveries from recession between 1948 and 1981, according to the McKinsey Global Institute, the economy returned to its prerecession employment peak in about six months. These transform complicated and costly products available to a few into simpler, cheaper products available to the many. The Ford Model T was an empowering innovation. So is cloud computing, which transformed information technology that was previously accessible only to big companies. Empowering innovations create jobs, because they require more and more people who can build, distribute, sell and service these products. Empowering investments also use capital — to expand capacity. Like the Toyota Prius, these replace today’s products with yesterday’s products and create few jobs. These reduce the cost of making and distributing existing products and services. Such innovations reduce the number of jobs, because they streamline processes. With these three different kinds of innovations, he proceeds to explain what the problem is today. Essentially, he is saying that capitalists are not investing in creating products (“empowering” innovations). 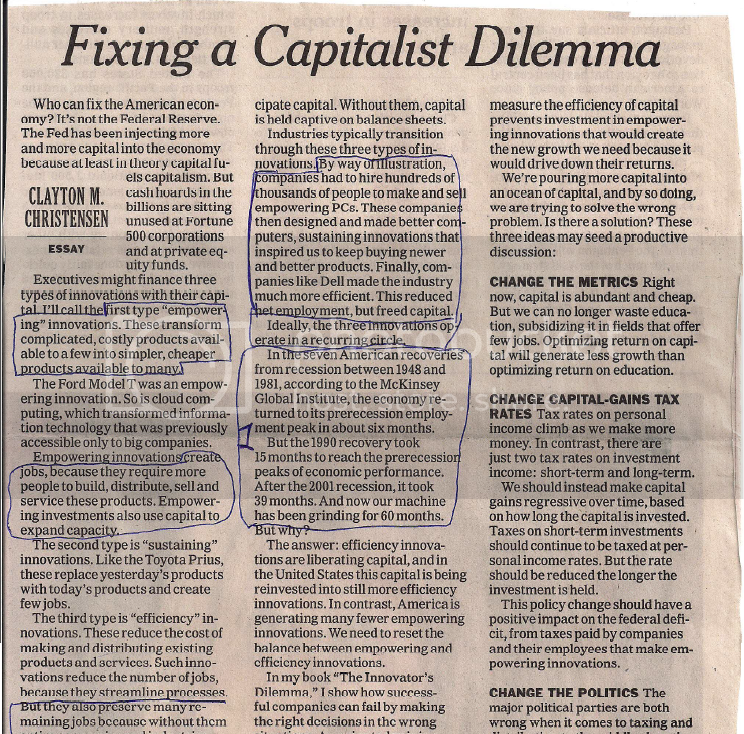 His is also saying that it “would create the new growth we need because it would drive their returns.” The capitalists are taking their capital and putting it into “efficiency” innovations to make their already existing manufacturing processes cheaper, more efficient. This in turn does not create jobs. He is criticizing them for not being job creators, and instead making their own functioning more cost efficient. The answer Christensen is advocating s a return to production. This is what I have previously said should be done Marx correctly pointed out that commodity production is the only thing that creates value. This “capitalist dilemma” is exactly that, the refusal to invest in commodity production, “empowering” innovations. Making labour more efficient doesn’t create new value, creating more commodities does. In essence, Christensen is only coming into by accident what Marx has already pointed out and explained. I for one, as well as many other Marxists have already advocated this. Commodity production is the only thing that can end a recession because it is the only thing that can create value. This is in line with what I have said in previous videos about the Quantative Easing rounds. Capital is being given to banks which are supposed to lend it out to begin production and consumption. Instead they have been hoarding it and entering it into their books as profit. They’re not doing what they’re supposed to be doing with the money. The banks won’t lend it out because the have no faith in the economy to be profitable and would get a return. But, there is no faith in the economy because the money is not being lent out. It’s a vicious circle of contradiction, as Marx said; capitalism is a system of contradiction. There is also no new production because firms are instead choosing to make existing production more efficient, thus raising profits. This is more profitable for them than taking a chance on new commodity production. This is why, as Christensen said, according to McKinsey Global Institute, our recovery from this recession is taking longer than ever. A historical 6 months as opposed to now, going on 60 months. Because commodity production has not begun once again as it has in the past. If this is the full way out of the recession, the answer lied with Marx. Christensen has juts repeated what Marx said with new words, from another perspective. This shows once again that the Marxist critique of capitalism is as valid today as when it was written.